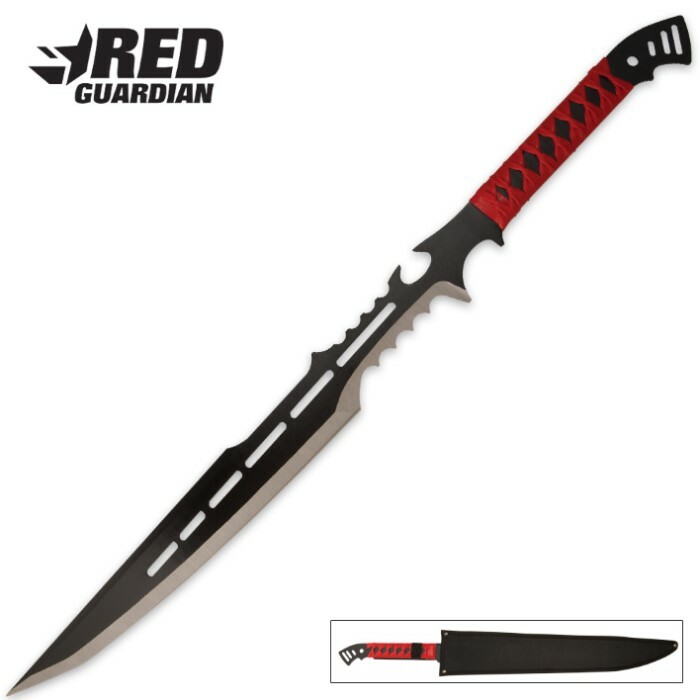 Red Guardian Fantasy Sword With Sheath | BUDK.com - Knives & Swords At The Lowest Prices! Sleek, dangerous, tactical! 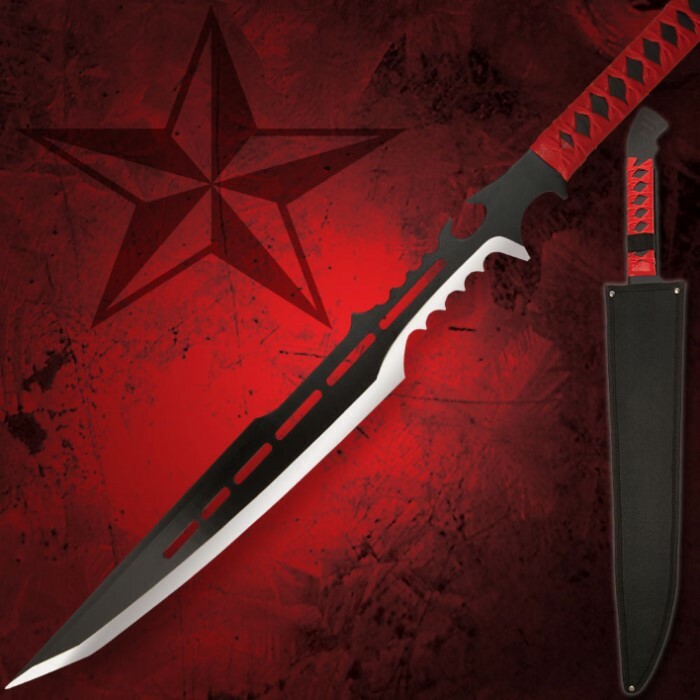 This 28" fantasy sword is one solid piece of cold hard, stainless steel with a heat-treated black baked finish. The blade features fantasy cut outs, teeth like serrations, and a piercing point, and slides smoothly into the included nylon blade sheath. The red simulated leather wrapped handle adds a sure grip for easy maneuverability. If there is a sword that screams to be picked up, this one is it! Good, not great. I have just used mine to do some brush clearing, yep, used it like a machete. Awesome cutting and weight. Did not dull the edge at all. It arrived reasonably sharp. Now, the bad. Hate the handle. The leather wrap is cheap. It breaks easily. The handle end will cut into you. The sword is not solid metal, there is a weld line between the handle and the blade. Not a bad weld. I beat the crap out of it yesterday and my body gave up, the sword did not. So, I guess thanks are due BUDK. I had thought all of the very low cost swords were, well, light weight wall displays and nothing more. This one has proved me wrong. I will fashion a grip for it and then bring on the zomibes! I have been collecting swords, knives, and daggers for years... I have many, but this one I bought myself for Christmas (keep forgetting to get on and write a review, came on to order one for my brother for his birthday since he saw mine and insisted that I get him one LOL and figured I'd do it now!) anyway, I bought it for myself for Christmas just because it looked cool and was on sale, I wasn't expecting it to be anywhere near as kickass as it is! It beat my expectations BIG TIME! It's razor sharp, cuts through anything and everything with such ease! It's lightweight and easy to handle. Such a beautiful piece, I get compliments on it all the time. I love this sword! I highly recommend it to anyone! says its razor sharp i guess they forgot to sharpen mine and its a little cheaper feeling than i thought it would be. The sword is very well made. The design is not just aesthetically pleasing but practical. The Blade is weighted at the end and light towards the back. If sharpened this sword can do some serious cutting. Another great feature is the scarab, fits perfectly and is made of some very durable material. My friend got one and I just fell in love with it! Every thing about it made me want one, the handle wasn't THAT bad idk why people keep ripping on it. If you take good care of it it'll be fine. Over all loved it! The handle felt very cheap. I did not like it one bit. Just got my sword today. I have to say that I have been collecting swords for a long time and I have to say for the price,I have never bought a better sword. Very sharp blade right out of the box and it came to my home very fast. I will be ordering a lot more swords from this site. VERY PLEASED! In one word this sword is wicked. The blade on mine is razor sharp. It has just enough give to deliver a solid hit without bending. The strapped handle will eventually need to be replaced but other than that just deadly. Awesome sword! The blade is very sharp. Really nice right out of the box. The sheath is well made.